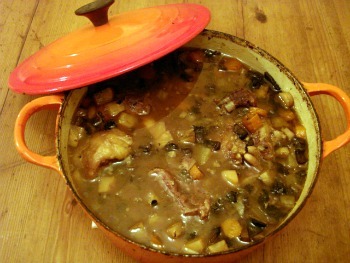 Recipe Of The Month: "Beef Shin, Oxtail And Cottage Garden Vegetable Casserole "
Happy New Year! With last year behind us it is time to look forward to the new year ahead. January is a great month to plan your cottage garden, do a little cottage decorating or simply snuggle up with a warm comforting casserole and some freshly baked bread. If you have not baked bread before it is truly one of the most delightful things to create and the taste is worlds apart from processed bread. This E-zine is dedicated to making bread, so if you have never tried to make bread before why not try this very simple recipe. Once you have got the hang of it you can create all kinds of tasty treats and you may never want to buy bread from a packet again. The cottager of mediaeval times always ate whole wheat bread, white bread was for the nobles and the king. Today it is the other way round! It really does not matter what type of flour you use as long as it is a good quality heritage or organic flour. Read the label on most supermarket flours and they will contain a ‘flour treatment agent’ this is not the flour you want as you will be making a supermarket loaf not artisan bread. Good bread should spring back when you squeeze it and release it. Processed bread will remain in a squeezed lump for ages…yuk! You can experiment with unleavened loaves or leavened loaves the difference is that one contains yeast (leavened) and the other does not (unleavened). The bread made with yeast will rise and be softer and last a few days, the unleavened will not rise and need to be eaten in the same day. The most important thing to remember with making bread is to use the best ingredients you can find. Home made bread made the old fashioned way is full of nutrients. I never recommend using ‘enriched’ flour. If you need vitamins eat your fruit and veggies. Look for heritage flour, find a flour that has been made the same way for hundreds of years. It will taste superior and if your going to the effort of making bread it seams a shame to cut corners. The first bread that was ever made was properly made without yeast, flour and water which baked will produce a brick! Nobody knows how the first bread loaf as we know it was baked. Baking bread with yeast was properly discovered by accident. If you make your bread loaf and then leave it alone wild yeast will get into to it naturally which converts the sugar; found naturally in the flour, into alcohol and carbonic acid gas. The alcohol will evaporate but the carbon dioxide will become gassy and create bubbles in the glutinous dough. Making the dough rise and when cooked it makes a larger, longer lasting loaf. It goes without saying that this discovery made meals ’bulk’ out and was easier for the cook. If you keep a little of your old dough it will, over time, take in wild yeasts. In North America the discovery of ‘sour dough’ bread is well known. Sour dough bread is made by using a little left over dough in each new batch of bread while adding to your original yeast mix to keep it replenished. Some original yeast mixes were started over a hundred years ago! This bread is most famous in San Francisco where it is said that the foggy climate is the best for making wild yeast dough. In fact sour dough will taste different every where it is made. A sour dough bread really makes the most magnificent sandwiches with a crunchy, bubbly, split crust and soft bread inside. This method was used where there was no yeast available. Now of course it is made by preference. There are three types of yeast; fresh, dry and quick dry yeast. Fresh yeast should be creamy with a putty colour, it should feel cool and break easily it should have a wonderful yeasty smell. Do not buy it if it has dry patches or is crusty. It will keep in a sealed container in the fridge for about a week. You can also cut it into small pieces and freeze it. You can find it in your local bakers if they will sell it to you. Otherwise look for it online. Dry yeast is your next best option and is easy to find in most shops. It will keep for a few months in the fridge, just read the packet. If its old its best to through it away. It will make the most incredible bread which comes out of the oven ‘singing’ which is a bakers term for the crackling and popping sound of the crust when the bread is baked perfectly. Quick dry yeast is a yeast that goes straight into the flour, no preparation required. This is just a choice, and the most simplest one, but to me it just does not feel right. * If you use fresh yeast in a recipe that calls for dry yeast double the quantity. If the recipe calls for fresh yeast halve it if you are using dry yeast. This is an important step in bread making because it releases the gluten and distributes the yeast throughout the dough. You need a good strong technique here, pull, push and knead the dough like you mean it ;) This is a great stress reliever. The dough will take on a life of it’s own and when your work is done it will be silky to touch and have a springy texture. This will take about ten minutes. When ready put it in a greased loaf pan covered with a tea towel. You now need to leave it alone to ‘prove’ meaning let it rise. This will take at least an hour or two depending where it is left. The best place to let bread ‘prove’ is in a warm spot; in an airing cupboard, or on top of the stove or aga. When it is ready for baking it should have risen and should jump back when you prod it with a finger. Cool before storing in an air tight container or freeze for a few weeks. The basic ingredients for bread are yeast, flour, salt and water. Variations include milk, butter, eggs, sugar, honey, bananas, carrots, olive or rapeseed oil, nuts and currants. You can mix whole wheat flour with white flour, spelt flour or rye flour. Or make baking soda bread instead of yeast bread. Or top with seeds like poppy, sunflower, dill or celery seeds. You can also brush the dough with egg yolk, milk or olive oil. For sweet breads you can brush with a sugar syrup. My friend who is a baker also makes yeast mixes with apple juice and fermented with cheese over night! The experimenting is endless. 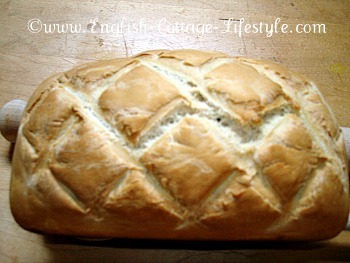 Begin with a basic recipe and make into a loaf, plait, twist, cob (lump) shape. Prepare yeast (follow directions on packet). If using fresh yeast (double the quantity) and mix in the warm water. Leave for approximately ten minutes until it is frothy and with bubbles. In a bowl combine the flour, salt and yeast (when ready). Bring together in a rough dough. Add the oil and begin kneading on a floured surface for about ten minutes. (See kneading above). Place in buttered/oiled loaf tin or baking sheet in the shape you want. Leave to ‘prove’ in a warm place for about an hour or more until it is ready (see kneading above). You can score the bread with a knife when it is ready to bake for a crusty effect. Pre heat oven 200 degrees C/400 degrees F/ gas mark 6/or use the roasting oven in an aga. When the bread is ready to bake put a bowl or metal pan of warm water into the oven (this makes the crust fantastic and is a great bakers tip) then place the bread in the middle of your oven, or on the bottom shelf of a roasting oven in an aga. Bake for 25 to 45 minutes depending on the size of your bread. When ready remove from oven and leave on a cooling rack or a couple of wooden spoons to cool. Bread is lovely when warm so don’t let it cool too much. Serve with fresh country butter. Enjoy. The month of January is the time to plan for the year ahead. Organise your garden plan, test your soil and get any digging done if the ground is not frozen. Now is also the best time to move any plants, trees or shrubs into different areas if you are not happy where they are. Have a look online or through gardening catalogues for inspiration for your cottage garden. Remember to feed wildlife if you want to attract birds and nature into your garden. …So get cosy with a cup of tea and travel to the South East of England. "Beef Shin, Oxtail And Cottage Garden Vegetable Casserole"
This recipe goes great with fresh bread and butter. The amount of ingredients you use will depend on the size of your casserole pot. Have fun with this recipe and add what you want. You cannot really mess it up just make sure the meat is falling off the bone before your serve it. You don’t even need stock, water will be fine as the oxtail and vegetables will create its own stock. The secret is in slow cooking at a low temperature for several hours. 3 Thick chunks of beef shin from your local butcher. 2 Thick chunks of oxtail from your local butcher. Beef dripping (for searing) from your local butcher. 1 tsp Coleman’s dry English mustard to taste. 1) In a pan heat some beef dripping and then sear the seasoned beef shin and oxtail. Remove and sit on a plate. Now semi cook the sliced mushrooms. Put on plate. Add water to pan to make a stock base. 2) Half fill the casserole dish with a mix of prepared vegetables, add salt, pepper, mustard and sage then add the meat and mushrooms and any juices left on the plate. Top up with the rest of the vegetables season to taste. 3) Fill the casserole dish with water from the pan this will make your simple stock (you can use a home made stock if you want). Place the casserole dish on a baking tray to prevent any spilling over in the oven. 4) Put in a pre heated oven on a low temperature, 160 degrees C/325 degrees C/gas mark 3 the casserole should not boil. Cook for several hours until the meat falls off the bone. Depending on your oven this will take at least three hours. Its hard to over cook beef shin and oxtail just make sure the oven is on a low temperature. Get your cameras ready….Do you have photos of beautiful English cottages and English cottage gardens? 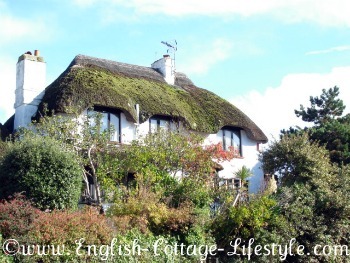 Have you decorated your cottage English cottage style? SBI! The company who I build my website and e-zine with (see add below) is bringing out a brand new set of tools hopefully by the end of January. I may well be having a play around and change the look of this website, it really depends what I get to choose from.